The Gulf of Maine Council on the Marine Environment is celebrating its 25th Anniversary with a geocache tour of the Gulf of Maine Watershed. The Gulf of Maine Council GeoTour was created to encourage people to get out, learn about and experience the beauty and value of the Gulf of Maine for themselves. The GeoTour is like a scavenger hunt, but instead of visiting locations to collect objects, participants will be finding answers to site specific questions and collecting points. The treasure, a limited edition Gulf of Maine Council 25th Anniversary Geocoin, is available to participants who collect enough points and send in their GeoTour Passport. The Gulf of Maine Council has partnered with organizations and geocachers in each of the five provinces and states that border the Gulf of Maine to create the GeoTour. Sites were selected to highlight just some of the important natural, historic, cultural or economic features in the region. 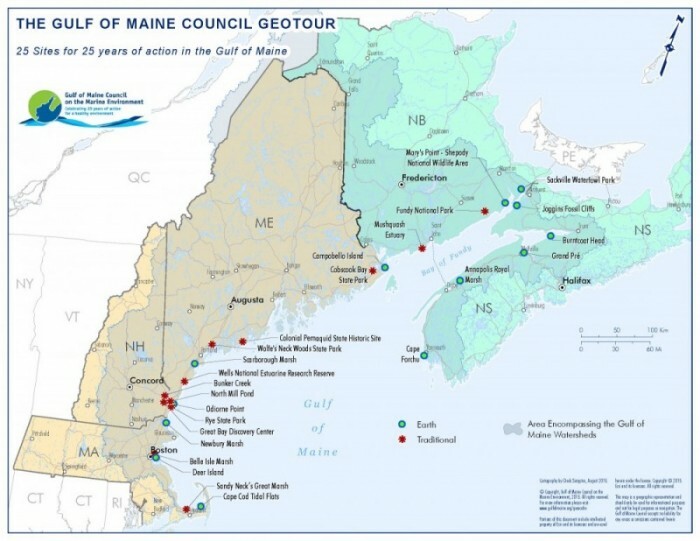 Five sites are located in each of the five provinces or states that border the Gulf of Maine – Nova Scotia, New Brunswick, Maine, New Hampshire and Massachusetts – making twenty-five sites to celebrate twenty-five years of the Gulf of Maine Council.